Day 17 of our 30 Days of Cozy brings us this lovely, variegated Autumn Adventure Cowl from Trinity of Yarn Has My Heart. Purchase the ad-free, downloadable version of this cowl pattern on Ravelry. 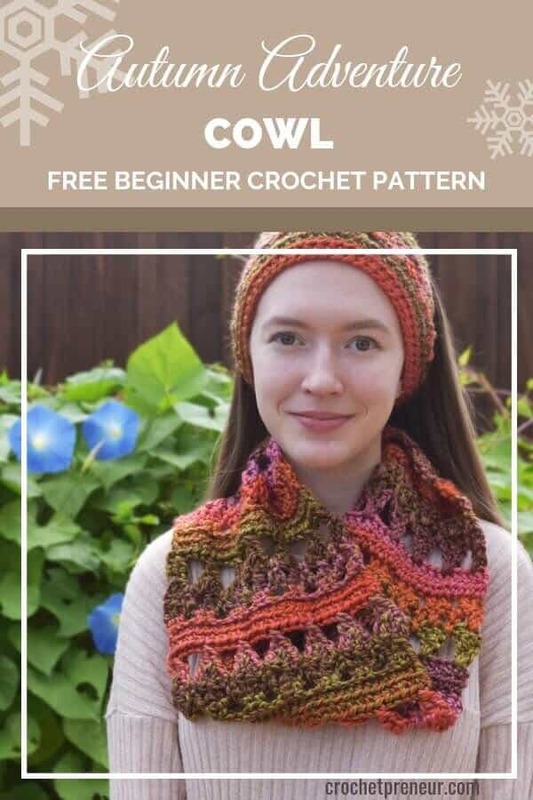 Purchase the premium pattern which includes instructions for the cowl and a matching headband, here, on Ravelry. Measurement(s): The finished cowl is about 9.5” tall by 32” around. You can use any method you prefer to join the ends of each piece. As written in the “Stitches Used” section below, when working row 4, *make sure* that you sc around both the ch 3 from row 2 and the ch 2 from row 3. The sc should gather these two chains together, and there will not be any free-standing ch sections left. To work the “sc around previous two ch spaces” stitch, place the hook under the ch 3 and the ch 2 from the two previous rows, yarnover, draw up a loop, yarnover, and pull through both loops on the hook. Pull slightly on the working yarn to tighten the sc around the ch. Make sure you work the sc around both the ch 2 and the ch 3. I know you’re going to love making the Sirena’s Cowl and I so look forward to seeing your finished product. Trinity Vincent designs knitting and crochet patterns under the name Yarn Has My Heart. She has a passion for designing and is constantly seeking new ways to grow creatively and connect with other makers. Starting Yarn Has My Heart has been the perfect creative outlet as Trinity works through her second year of college as an IT major. When she’s not knitting, crocheting, or thinking about either of those things, you can probably find her doing homework, drawing, or hanging out with her younger sister. She is grateful for all the wonderful opportunities she has had in the design world so far, and she can’t wait to see what the next months and years will bring.